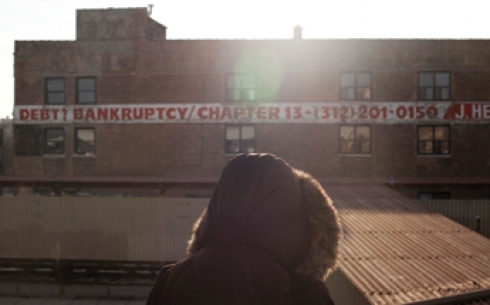 Thousands in Cook County are turning to bankruptcy for relief from debt. In 2010, more than 117,360 bankruptcy cases were filed in Cook County, up 139 percent from 2006. Photo by Jason Reblando. Freeman Hess sits at the dining room table in his brick bungalow in Roseland on Chicago’s South Side. At 78, his gray hair is thin and fuzzy, like the coating of a peach, but his arms are muscular. He hasn’t lost the physical strength he acquired from operating a forklift for Cook County for 43 years. But in all his years of work, starting off picking cotton in Brownsville, Tenn., and coming to Chicago for better opportunities, he never imagined retirement being so stressful. “They” is a collection of people—his lawyers, his creditors and the bankruptcy trustee. Hess filed for bankruptcy two years ago, and ever since, he’s been paying $1,090 a month, the majority of his income, to try and get rid of his debt, with two more years to go. With the economic downturn, many Cook County residents are facing a similar situation: less money coming in, and more bills than they can handle. And more people, like Hess, are turning to bankruptcy for relief. But many, particularly those in black communities, have been filing Chapter 13 bankruptcy, which carries a high risk of failure, leaving themselves vulnerable to end up with yet another mountain of debt, instead of a fresh start. According to new data supplied to The Chicago Reporter by the Chicago-based Woodstock Institute, nearly a third of all bankruptcies in Cook County were filed under Chapter 13. Among filers living in communities where African Americans made up more than 80 percent of the population, the rate was much higher, with nearly a half of bankruptcies filed under Chapter 13. Nationwide, only 10 percent of Chapter 13 filers complete their plan and get a discharge of their debt, according to a 2010 study in the Berkley Electronic Journal of Economic Analysis and Policy. Geoff Smith, vice president of the Woodstock Institute, a nonprofit promoting community reinvestment and economic development, said a large number of Chapter 13 filings in some communities is alarming. O.S. Owen, a financial counselor at the Center for Economic Progress, said people aren’t getting the relief they need because of a lack of proper financial education. He added that all potential bankruptcy filers should be required to get assistance from a mentor, both before and after their filings, to help them understand the process and how to better manage their finances. Sugey Lozano says she meets at least one couple who is considering bankruptcy each week. As a financial counselor for the Center for Working Families at the Instituto del Progreso Latino, she says most people have been wrestling with financial problems for awhile. But making the decision to file for bankruptcy can be stressful. Lozano says many people are reluctant, especially because of the social stigma of going bankrupt. “I tell them, ‘At the moment, it’s not something that you see yourself doing, but this might be the best thing you’re going to do. You’re going to start fresh,’” Lozano says. Although bankruptcy is commonly thought of as financial rock-bottom, the option of filing for bankruptcy often isn’t available to individuals who are struggling the most, says David Yen, a bankruptcy lawyer at the Legal Assistance Foundation of Metropolitan Chicago. For those who do have the money, they then have to decide how to file. Most bankruptcy filers choose either Chapter 7 or Chapter 13 status. Each chapter has its own benefits, drawbacks and legal stipulations, Yen says. Chapter 7, the most common form of bankruptcy, is quicker. In a Chapter 7 bankruptcy, people pay for their debt by liquidating their current assets, and afterward, their debt is absolved. Each state allows people to exempt some of their assets from being liquidated—up to a certain value in cars, home equity and personal items. Everything else is sold or repossessed, in exchange for their debts being eliminated. After a Chapter 7 bankruptcy is completed, people no longer owe anything to their creditors. In Chapter 13, people pay for their debt out of their future income. People filing a Chapter 13 bankruptcy come up with an amount of money they can pay each month toward their debt. They pay a set amount each month for three to five years, and when they complete their plan, any remaining debt is discharged. “In a Chapter 13, you’re always coming up with a plan to use some of your future income to reorganize your finances,” Yen says. Unlike Chapter 7, Chapter 13 allows people to keep their assets, as long as they’re able to continue paying for them. For example, people who are behind on their mortgage can have that debt folded into their Chapter 13 plan and thereby keep their house. Chapter 7 filers would only get to keep up to $15,000 in equity in their house and likely have it sold off. People may also choose Chapter 13 if they don’t have the money to pay their lawyer and fees upfront as they can be folded into their repayment plan. A Chapter 7 bankruptcy is cheaper overall, but the money has to be paid upfront. Hess got behind on his bills when he bought a 2008 Dodge Charger after retiring. The car payments, coupled with some credit card debt and a Wells Fargo loan he took out to repair his roof, was more than he could afford to repay. But when his lawyers told him he’d lose his house if he filed for Chapter 7 bankruptcy, Hess opted for Chapter 13. At the time, he also opted to save his car, a move he now regrets. Thousands like Hess in Cook County are turning to bankruptcy for relief from debt. The data from the Woodstock Institute show that, in 2010, more than 117,360 bankruptcy cases were filed in Cook County, up 139 percent from 2006. Those filings are concentrated in predominantly black communities. In predominantly white communities where the minority population was less than 10 percent, about 1.8 bankruptcy cases were filed for every 100 people between 2006 and 2010. In communities that are more than 80 percent black, the rate was nearly three times as high—5.2 filings per every 100 people. Woodstock also analyzed what kind of bankruptcy people chose—Chapter 7 or 13—and found that predominantly black communities also had more than 10 times as many Chapter 13 filings as in predominantly white communities. Of the 34,856 bankruptcy cases filed by people living in predominately black communities between 2006 and 2010, 16,696 were Chapter 13 cases—47.9 percent. In predominately white communities, only 7,036 bankruptcies were filed in the same time period, and just 1,583, or 22.5 percent, were Chapter 13 filings. David Siegel stood at the side of the room, shifting his feet like a heavyweight preparing to enter the ring. Three pictures of his face were displayed on the small stage in the basement of Friendship Baptist church, set up like a trinity of look-alike deities with large chins. The signs read, “Solving Financial Problems and Changing Lives through Education, Counseling and the Law,” and more than 40 people have gathered to do just that—to participate in a “financial healing” seminar advertised in the community. Judging by the nodding, raised hands and the occasional “Amen,” Siegel’s message was much needed here on Chicago’s Far West Side. After explaining the basics of bankruptcy and offering a free consultation, Siegel’s firm gave the participants, all African Americans, a catered dinner and even raffled off a flat-screen TV. The fact that African Americans are overrepresented in bankruptcy cases—among Chapter 13 filings, in particular—has been thought to be a product of economic disparities. African-American families are generally less wealthy than their white counterparts, leaving them more vulnerable to financial collapse and more likely to choose Chapter 13 to save a house or avoid lump-sum legal fees. But new research shows this may not be the case. Bob Lawless, a University of Illinois at Urbana-Champaign law professor specializing in bankruptcy law, found that even when he controlled for factors like home ownership and income, African Americans were still twice as likely to file for Chapter 13 protection as white people. Lawless is quick to point out that correlation between filing choice and race is not causation. But considering the sizable failure rates of Chapter 13 plans, it may mean black communities aren’t getting the “fresh start” that bankruptcy is supposed to offer, he said. “It means that they’re getting less effective legal relief than persons of other races,” Lawless said. Siegel thinks it’s not that lawyers look at a black client and automatically steer them toward Chapter 13, but that certain firms try to steer all their clients toward Chapter 13. Those firms also happen to market their services to the black community, where bankruptcy is more common. At the seminar, Siegel warned his audience about unscrupulous attorneys. “There are attorneys out there that will put people into a Chapter 13 plan because they can make more money off of them,” Siegel told his audience. Siegel said the court-approved flat fee for a Chapter 13 is $3,500, while Chapter 7 fees vary but often are much lower. That price difference may make some law firms push their clients toward Chapter 13, he said. And the Berkley Electronic Journal of Economic Analysis and Policy study found another attraction that Chapter 13 plans hold for some firms: Even with the sky-high failure rate, attorneys are able to collect the majority of their fees. The Reporter looked into 100 bankruptcy cases in each of three Chicago communities—Roseland, West Englewood and Ashburn—where the highest numbers of Chapter 13 cases were filed and found more than half of the filers were represented by lawyers from five law firms: “Debt Stoppers” by the Law Office of Robert J. Semrad and Associates, the Law Offices of Ernesto Borges, Gleason and Gleason, “Legal Helpers” by Macey and Aleman, and the Law Office of Peter Francis Geraci. Of these five firms, Debt Stoppers represented 44.4 percent of the cases. He said his firm does represent mostly African Americans but not because they’re trying to steer clients or rack up fees. “I am African American, and I do market myself in the African-American community,” Borges said. Other firms declined to comment on the record or did not return repeated requests for comment. Siegel said a lot of bankruptcy filers don’t get a second opinion—something he thinks is vital to making sure you’re getting good advice, whether that means Chapter 7, Chapter 13 or not filing bankruptcy at all. Hess is one of those who may have been better off never filing bankruptcy. At the end of his four-year plan, he’ll have paid more than he initially owed to his creditors, with no debt left to discharge. Lawless said Hess may have had an easier time just settling with the collections agencies. Contributing: A.Jay Wagner, Allison Griner and Louis McGill. This story was produced in partnership with the Woodstock Institute, which will publish its study on bankruptcy trends in May. For more information, visit www.woodstockinst.org.